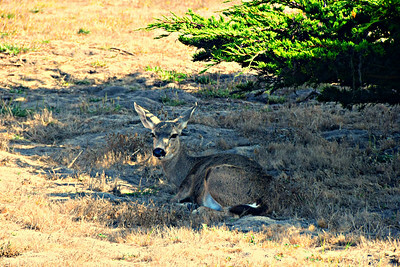 So, we set out this morning with our first destination behing Carmel-By-The-Sea. I picked that small community to be the place where we had our mail sent from our mail forwarding service in Florida. It wasn't the most convenient place to where we are camped (50 miles away), but I figured 1) we would do some exploring over there, and 2) they might be less likely to lose our package than other places. What I didn't know at the time was the post office is a very important part of the community. You see, the one square mile that is Carmel-By-The-Sea has no house numbers or street addresses, so everyone goes to the post office to get their mail. That little tidbit gave me more confidence they would not lose our package, and they had it (though I called first to make sure someone could put their hands on it). Just like any other post office used for general delivery, I just stated my name, showed my driver's license, and they handed me my package. The hardest part was actually getting to the post office on the narrow streets and having to detour around some road construction. 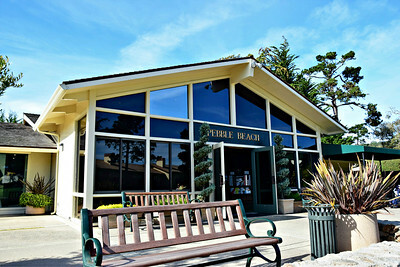 Carmel-By-The-Sea is also the town where Clint Eastwood was mayor from 1986 - 1988. Linda's Mom relayed the story that she and Linda's Dad once got a parking ticket there, and her Dad didn't pay it because he wanted to keep the ticket with Clint Eastwood's signature on it. After the post office, we got the car washed as it was still filthy from our wild goose chase in eastern Oregon the other day. 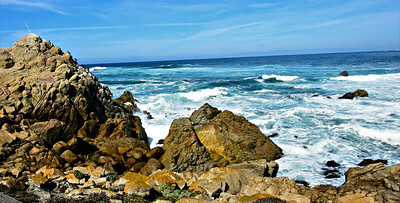 And we decided to do the 17-Mile-Drive on the Monterey Peninsula. It's not the type of thing we we would normally do, but Linda's Mom recommended it, and I couldn't resist the opportunity to visit The Pebble Beach Golf Links. 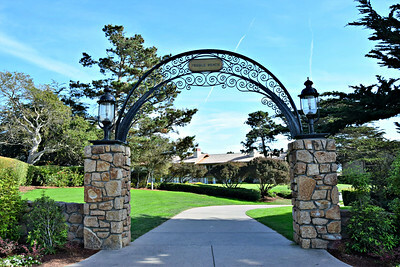 There are three different entrance points, and a gate at each one. As of the time of this writing, they charged a fee of $10.25 and hand you a brochure that includes the map below and a list of stops. 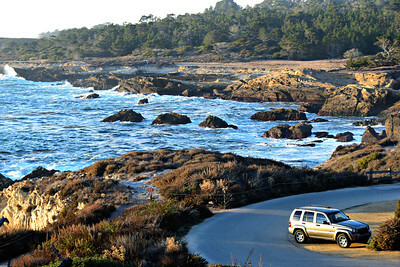 Admission to 17-Mile Drive is $10.25 per vehicle, cash only. 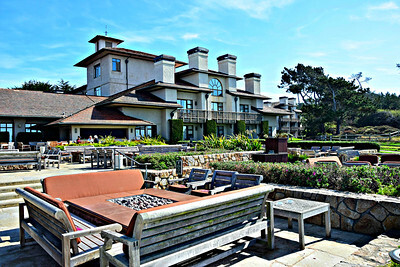 The gate fee is reimbursed with a purchase of $35 or more at all Pebble Beach Resorts restaurants, excluding Pebble Beach Market. 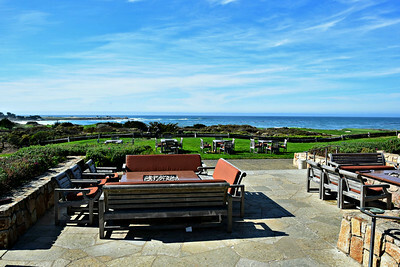 Admission is complimentary for overnight guests of The Lodge at Pebble Beach, The Inn at Spanish Bay and Casa Palmero. Lot's of tourists don't know that little bit of information and don't read the receipt, so we thought we'd share it. Chances are, if you stop for a meal along the route, you will spend more that $35, so you might as well get your money back on the access ticket. We started at the main gate off of Hwy 1, and went counter-clockwise. The brochure/map is laid out to begin there. to a view of the golf course and ocean. It was beautiful back there, and I had a sudden urge to get my golf clubs out. Linda said she felt uncomfortable .... like we don't belong. I laughed and said "We don't belong. There was a time when, for a couple of years, we might have belonged, but that's long since passed. Still, just act like you belong with confidence." We were casually, but appropriately dressed; at least we were dressed better than we usually are. No one batted an eye as we walked around. Several of the staff were quite polite welcoming us and addressing us formally. It wasn't nearly as "stuffy" as you might expect. Moving on, we stopped at Spanish Bay Beach where people had built little rock towers. We watched some surfers and walked the beach for a few minutes. 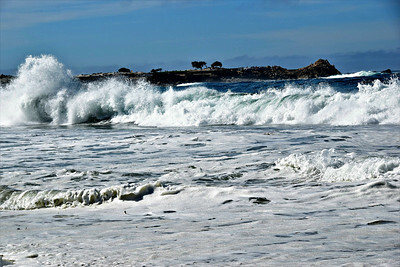 The waves were pretty good-sized, and the surfers were skillful. The next stop is called "The Restless Sea" as the water is always churning there. We particularly noticed the beautiful shades of blue..
while I looked at this par 3 hole on one of the six golf courses along the drive. As we walked back to the Jeep, Linda stepped on the edge of a small rock, her ankle gave, and she crumpled to the ground. I dropped the camera, and went to make sure she was okay. She got up, but she had a huge scrape on her shin and a bloody knee. And she may have pulled a muscle in her rib cage as she had some severe pain when breathing deep or bending over. It wasn't bad enough to go to an immediate care clinic or emergency room, and she continued on. There are 21 designated stops on "the drive", but we skipped a few of them. 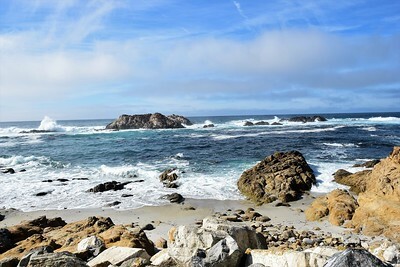 You can get a little more detail about each stop at these two web pages: A Complete Tour of 17 Mile Drive (Part 1) and (Part 2). Our next stop was Bird Rock. 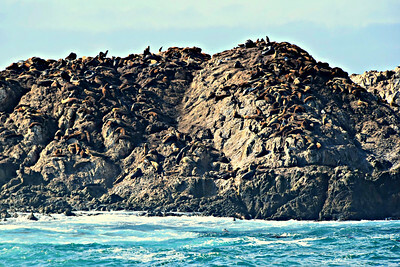 It's hard to tell in the photo above, but Bird Rock was covered in California Sea Lions. 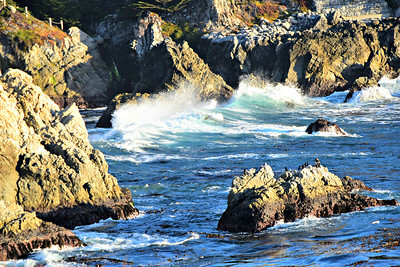 They were splashing and playing in the surf and climbing up to high points on the rock. 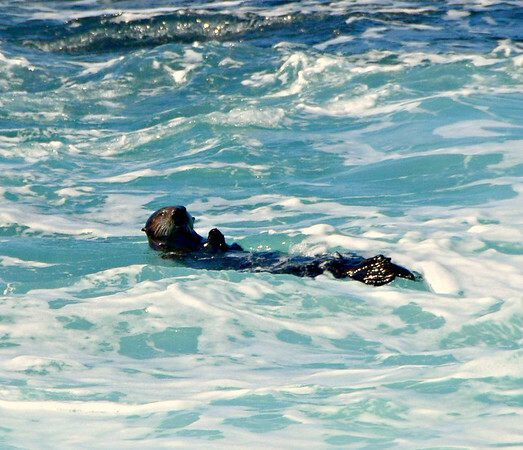 There were also a couple of Sea Otters out there in the kelp. We were glad we both grabbed our binoculars before we left the rig. 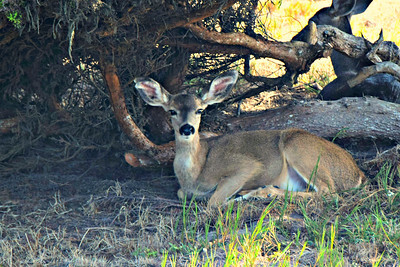 Continuing, near the road, a small herd of Black-tailed Deer rested in the shade along a golf course fairway. Our next stop was the Fanshell Beach Overlook. The waves in front of the beach were more interesting than the beach itself. But in April through May of each year, Harbor Seals come to the beach to have their pups. and once again, the water colors were mesmerizing. 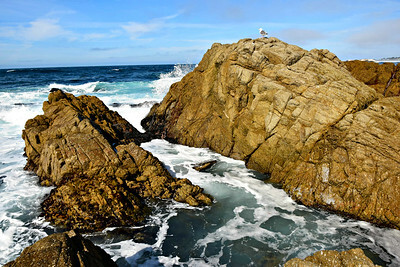 On the other side of the point, we had this view and I took a close-up of a gull with a wonderful blue background. But our favorite thing about this stop was getting a good look at a feeding Sea Otter. 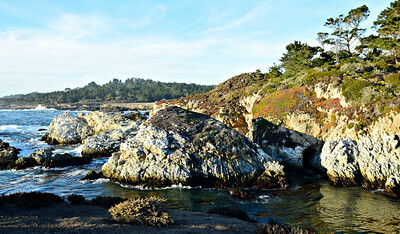 We then made a stop at the Cypress Point Lookout where parking is on a short spur between coastal houses. I assume the eight-foot chainlink fence around the overlook is due to its proximity to the residences, but it certainly took away from the view. We did briefly see a Harbor Seal there through the holes in the fencing. 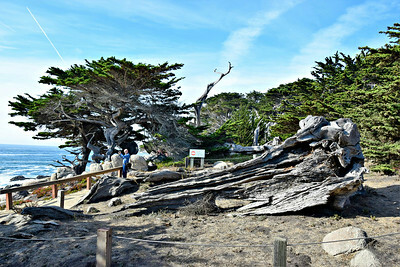 The next stop was the famous Lone Cypress. This tree, estimated to be 250 years old, is growing on top of a rock. 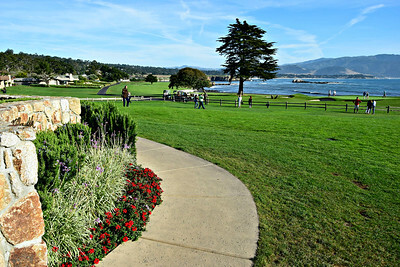 It was adopted as the logo of Pebble Beach since the club was started in 1919. 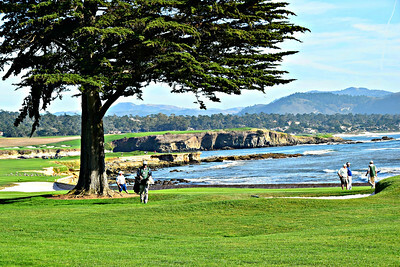 Pebble Beach has trademarked the tree as their logo, but they also claim that they have trademarked the tree itself, and no one can use an image of the tree for commercial purposes. They have used this argument against local artists. According to them, you can't sell a photograph, sketch, or painting of the tree without violating their trademark. My guess is it would never hold up in court, but it's not worth the legal costs to fight their claim. 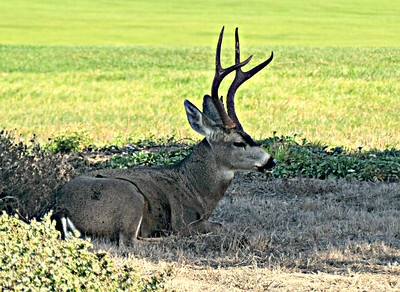 Photographer Don Smith wrote an excellent article on this subject - Are We Heading Down A Dangerous Path? It's an interesting read that basically comes to the same conclusion I have. They would lose in court, but it's not economically worth the fight so no one has challenged them. The fact that Pebble Beach Corporation bullies artists and others defending something that wouldn't affect them in the least certainly reduces my opinion of the company. 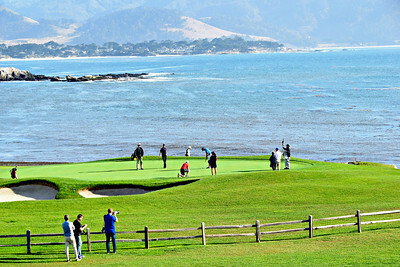 I'm not the activist type, but since 2019 is Pebble Beach's 100th anniversary and they are hosting the 2019 U.S. Open, perhaps a little public pressure could be exerted to abandon their stance. If I were an activist type, it might be fun and it would certainly garner lots of publicity. Of course, there are many much more important things in the world to worry about. 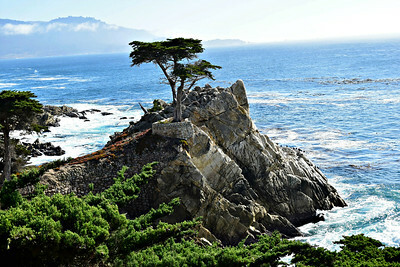 Now, I didn't know any of this until after we got back home and did some research on the history of the Lone Cypress. 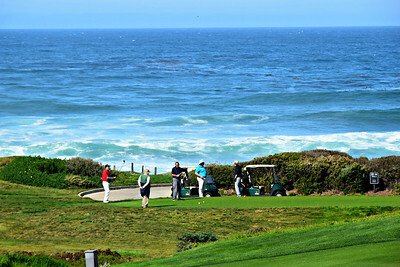 Of course, it still wouldn't have stopped us from visiting Pebble Beach, and I would still jump at the chance to play the golf course given the opportunity .... on somebody else's dime. 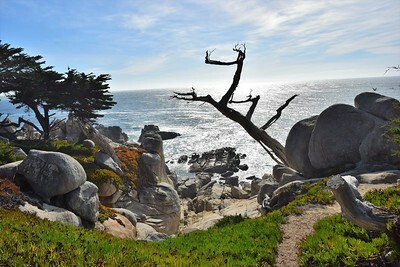 As for the Lone Cypress, the cachet of this particular tree is waning. It's not standing there naturally and hasn't been for a long, long time. They've built a retaining wall around it and there are several support cables holding it up. Frankly, I was a underwhelmed with this iconic tree. 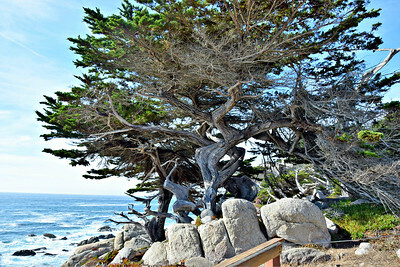 With that said, the type of tree, the Monterey Cypress, is rare. 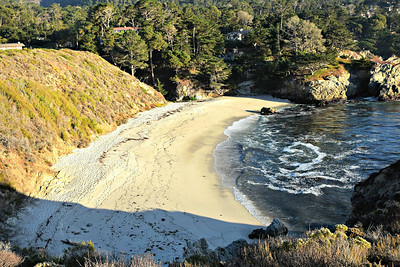 The only natural groves are found here on Monterey Peninsula and at Point Lobos on the other side of Carmel where we will be visiting later today. Our next stop was the Ghost Trees at Pescadero Point, where there are remnants of dead cypress mixed in with twisted specimens of live trees. 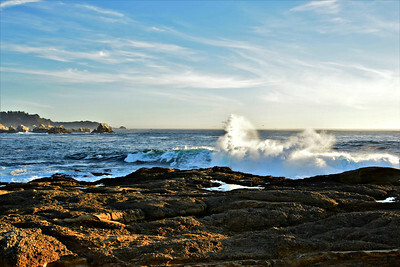 And there is a view out across Carmel Bay to Point Lobos State Natural Reserve. 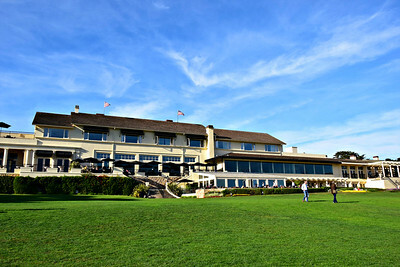 Our final stop was Pebble Beach Golf Links. We parked and strolled in through this unpretentious archway where there was no one checking I.D.s or guarding the gate as I had expected. The pro shop at the first hole was right as we walked in and looked like any country club pro shop anywhere. You are welcome to watch those teeing off on Hole #1, though there was no one there when we walked by. Even if you don’t have time to play, you can mill around the first hole and watch golfers nervously tee off their bucket-list rounds, or head down to the lawn behind the 18th green to catch a glimpse of them finishing up their unforgettable day. We walked by the various shops and looked for a place to get something to eat. I also wanted to go out on the lawn by the 18th green. 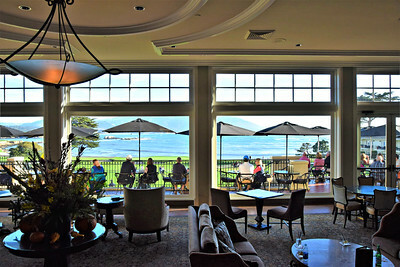 We once again just casually walked into the Lodge at Pebble Beach and the Terrace Lounge like we knew what we were doing, and no one gave us a second look. We took a gander (not a phrase they use around Pebble Beach) at a posted menu and were surpised that the prices weren't as outrageous as we expected. We've seen much higher prices at much lesser facilities. However, it said lunch ended at 3:00, and we got there around 3:10. Ah, but it never hurts to ask. I asked a server and she said they were still serving a limited menu on the terrace where there was a table for two open and waiting for us. 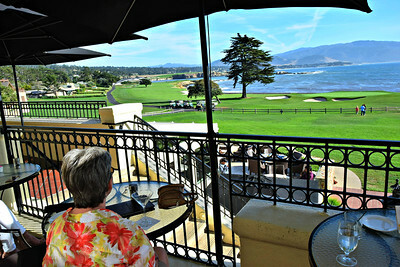 So, we grabbed a table overlooking the 18th hole and the ocean. We ordered a couple of "shared plates" and Linda ordered a cocktail that had a percentage of proceeds going to breast cancer research. We watched the groups finishing up their rounds as we waited for our food. There was a huge lawn where the public could walk up to the fence and watch. At times, folks from tour buses were everywhere taking pictures. And there were rounds of applause when players made good shots. That had to be somewhat intimidating for the amateurs finishing up what may be the round of their lives. Linda struck up a conversation with a lady about our age at the next table. She was from San Jose, and came down to meet her husband who was playing golf as part of a business outing. While they chatted and laughed, I walked around to take more photos. Soon, our plates arrived. 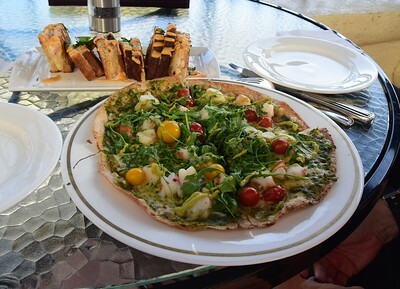 We had the Crab Grilled Cheese Bites - Monterey jack cheese, caramelized onions, buttered sourdough and the Open-Fave Shrimp Quesadilla - Whole wheat tortilla, pesto, pepper jack, arugula, tomato, poblano crema. Both dishes were truly delicious - not the "delicious because we paid a lot for it", but really tasty. We savored the food, the view, and the atmosphere, .... and Linda's new friend, Rita, along with a second cocktail, helped her feel much more comfortable in the surroundings. and to take photos of The Lodge from below. Standing there, looking up the 18th fairway, I got the sudden feeling that I had been there before. It was eerie. Maybe it was because I had watched so many golf tournaments, but for a moment I felt like I had stood in that exact same spot another time. I walked back taking one more photo marveling 1) that we were on the 18th hole at Pebble Beach, and 2) that it was so easy to be there. Back on the terrace, I paid our bill and made sure we got credit for our $10.25 drive ticket, somewhat lessening the financial damage from our late lunch. On our way out, I took a photo of the U.S. Open Championship trophy. 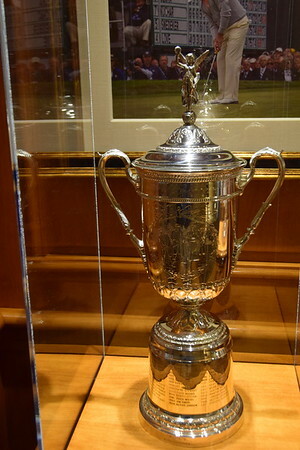 Actually, it's a slightly smaller replica as the 2018 U.S. Open winner has the actual trophy until it is returned for next year's tournament. 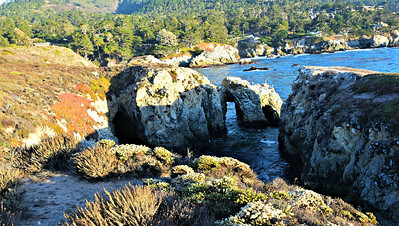 Linda surrendered the keys, and leaving Pebble Beach, we exited through the Carmel gate rather than completing the 17-mile loop back to Hwy 1. 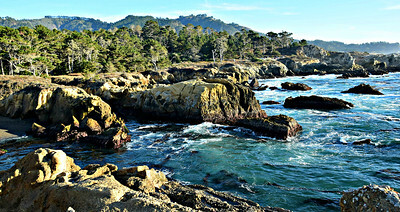 Before heading back to our campground, I wanted to visit the Point Lobos State Natural Reserve. 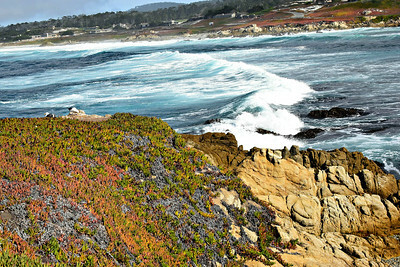 So, we made our way through Carmel hugging the coast until we saw a sign to Hwy 1. It was a very short drive to the state park, which was a good thing since we didn't have much time left before it closed at 7:00. 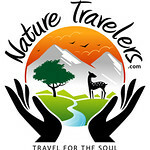 We paid our $10 entry fee and I inquired about an annual parks pass for California State Parks. They have serveral which you can read up on here: California Park Passes. The Distinguished Veterans Pass is a lifetime, no fee pass for California resident veterans that qualify and "Entitles the holder to the use of all basic facilities (including day use, camping and boating) in California State Parks at no charge." There are specific qualifications and some various restrictions, but California is to be commended for offering this pass. As for our options, we just won't be visiting enough of the state parks to justify the passes that cover day use fees only. 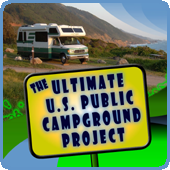 Some states have park passes that provide discounts on camping and sometimes a couple days of free camping. Often it is better to purchase an annual pass if you are going to be in a state a week or more and visiting several parks, but it all comes down to the math. In this case, the math just won't work. The gate attendant recommended the South Shore of the park, so we went that way, parked and walked along some of the South Shore Trail and accessed a couple of beaches. "Collecting" was prohibited, so Linda didn't spend much time looking for glass or rocks. It's a day-use only park and has a few other restrictions - no dogs anywhere, no drones, no baseballs, footballs, soccer balls, frisbees, or kites, no bikes on trails, and no smoking or any other kind of fires. 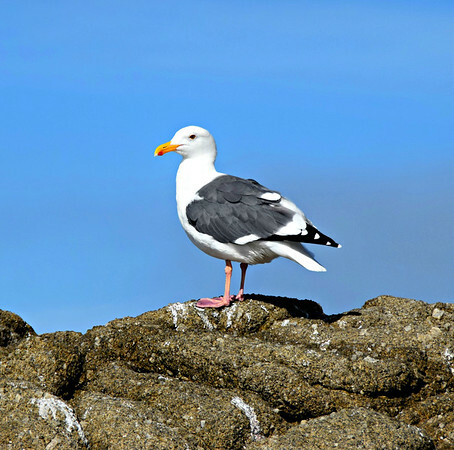 We ran into a couple that were docents in the park as they were getting ready to do some tide-pooling, and they graciously offered us some suggestions for our limited time there. We drove to the end of the road and parked at the Bird Island trailhead. Unfortunately, Linda was becoming more sore from her earlier fall (and she was sleepy from her earlier cocktails), so she stayed in the Jeep while I did the short, easy trail. 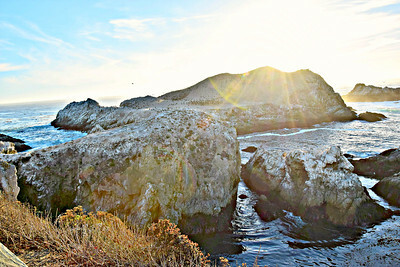 We just missed perfect lighting for the China Beach cove, but it still wasn't bad. but access to the beach is closed off for the very common "Vegetation Restoration". But it's also another beach where Harbor Seals come to have their pups in the spring. 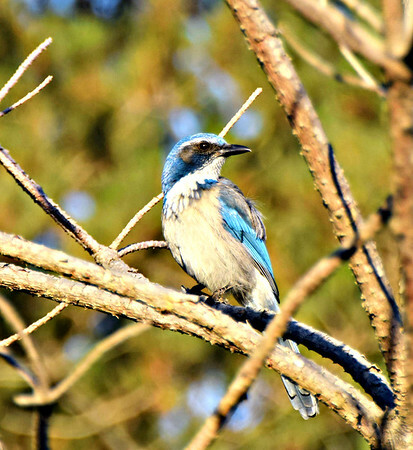 As I walked, this California Scrub Jay posed nicely. 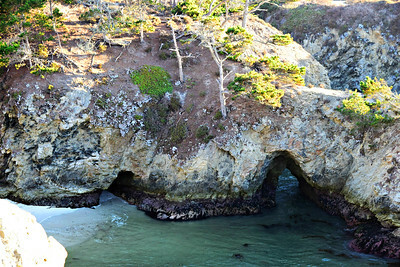 As the trail circled right, there was a small beach on the left, but it may have been private. until I came to what was clearly Bird Island. It was mostly Brandt's Cormorants and Brown Pelicans, and I'm sure there were more species, but I didn't really take the time to do much identification since the lighting wasn't in my favor. On around the loop, there was another natural arch. With my binoculars, I watched three or four otters feeding and playing in the bay for a few minutes before taking one more photo and then returning to the parking lot. and I parked in the larger parking lot where there is an information kiosk at the point where the main road coming in turns left along the south shore. Linda again decided to sit out the walk, but this time she was pointed toward the ocean and the sunset. 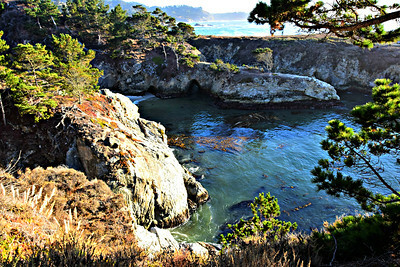 Deciding between the Cypress Grove trail and the Sea Lion Point trail, I went with the sea lions over the trees. 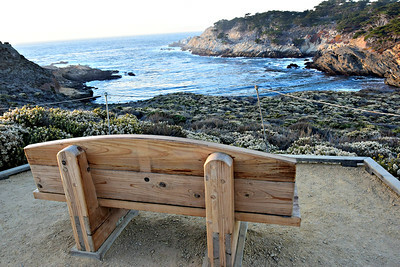 This was another "lollipop" loop hike/walk with viewing benches along the way. 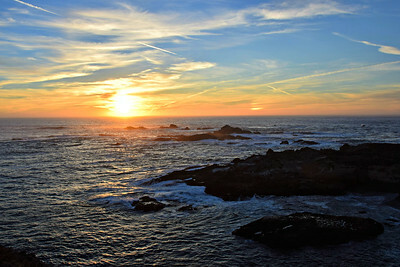 Walking around the loop to the point, I could hear and smell sea lions, but I couldn't see them looking into the sun. There were a couple of otters that floated nearer to shore, and I watched them while I waited for sunset. Though it was quite a warm day, it was chilly at oceanside. Note to self, "Bring a windshirt or jacket next time we're on the coast". but I got too cold to wait for the big orange ball to sink below the horizon, so I hustled back. Okay, one more pic. 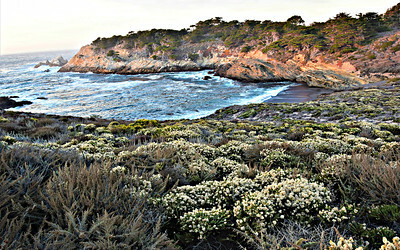 This is the cove between the Cypress Grove point and Sea Lion Point in the twilight. 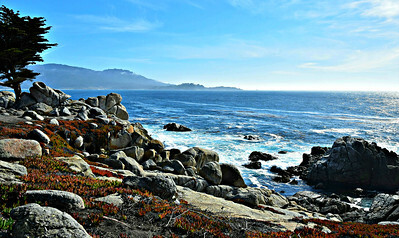 So, except for Linda's fall, we had a wonderful day admiring the beauty of the central California coast. The plan was to stop in Hollister on the way back and pick up some groceries, but it was getting late and traffic slowed us down. So we bagged that idea, and went back to the Bolada Park Event Center. The gate was closed and locked, but I remembered they key they gave us. We pulled through the gate and re-locked it before making the short, bumpy drive to our rig and called it a night. Tomorrow, we'll have to see how Linda feels, but I may be going to Pinnacles alone. We did that 17 mile drive on our e-bikes. Lovely ride! 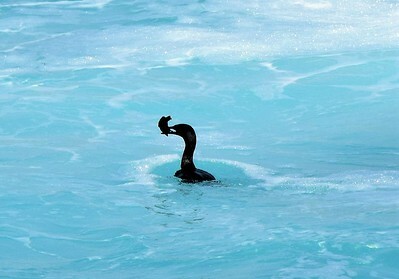 So sorry Linda hurt herself :( Great pictures of the sea otter and jay! My golf game and budget do not support playing at courses like Pebble Beach and Pinehurst #2 but the budget does support lunch and the fantastic views at these and many more great golf courses. In addition to the above, I enjoyed lunch at Augusta National (a couple very inexpensive palmetto cheese sandwiches and a $3 beer during a Masters practice round), Whistling Straights in Wisconsin, Kapalua on Maui and, most recently, at Cabot Links on Cape Breton in Nova Scotia. 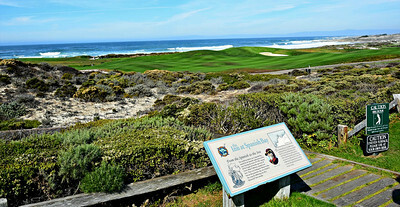 Pebble Beach was in 1992 and I'm glad to hear that it is still as accessible for us regular folks now as it was then. Lunch at Pebble (and maybe Bandon Dunes) is on the agenda for our 2019 RV trip. Thanks for bringing back some of my great memories and thanks for sharing all your adventures! Tom, I too enjoyed a reasonable lunch at a Masters practice round several years back. And, in my former life, I was privileged to play Whistling Straits, Valhalla (a few times), TPC Sawgrass (a couple times), and a few other PGA tour courses. Have not visited Bandon Dunes, but Nova Scotia is on our list for 2020, so we'll see about Cape Breton. Take care and enjoy that 2019 trip!